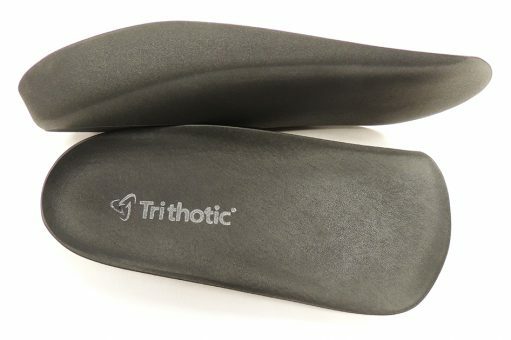 Designed by Jim Philps, Trithotics® are generic, ¾ length podiatric style orthoses that are suited for treatment of pathology associated with a pronated rearfoot and help facilitate sagittal plane motion. The design incorporates ‘tri-plane’ control which increases STJ supination moment by applying force medial to the STJ axis. The shape under the midfoot doesn’t restrict first ray function and the flat base under the heel provides stability. The length of the Trithotic is ¾ therefore fit to the length of the webbing. They do not need to be heat molded to the foot. They are ideal for slimmer shoes and children’s symptomatic pronation problems.